Young children have amazing imaginations unaffected by reality, so art projects that create props for make believe are particularly fun to do! 1. Gather your materials. You will need some heavy paper or card stock, crayons or markers, some glitter (of course!) glue, tape and a drinking straw for the handle. 2. Draw 2 stars or cheat like me and use a cookie cutter as a template on one piece of paper.Your wand doesn't have to be a star, I like to use some shape we are learning just for reinforcement but remember not all activities have to have a clear cut lesson. Kids are always learning, especially during play! 3. Decorate your stars with crayons or markers. I usually tape down the paper so it's easier for my toddler to do the activity and not worry about the paper shifting. 4. Time for glue, drizzle it all over. 5. Add the dreaded or loved sparkles , shake off the excess and let dry. 6. When dry cut out the stars and tape the straw to the inside. 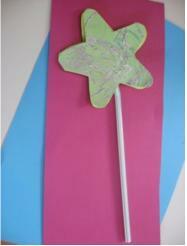 Then glue or tape the two stars together sandwiching the straw. Let dry and voila!